The purpose of this post is to list out how startups are bypassing established companies so that incumbents glean the best tactics and apply them to their own corporate innovation. Tech startups are designed, built, and managed differently than established companies, giving them a competitive edge against incumbent corporations. This post outlines startup advantages, including cultural differences, business models, and business strategies. But, established companies aren’t sitting around idle; they’re adopting these same strategies in order to compete, emulate, or lead in their market. See how corporations are deploying ten types of innovation programs. In our work at Crowd Companies, we’ve observed that big, established companies possess advantages in their tremendous resources, trusted brand names, and experience in their field, they are also plagued with gears that are slow to turn. Herein lies the greatest difference between a startup and and an established corporation: The core ethos of the organization is built differently. 1) Smaller, faster. Smaller in size, startups can quickly redirect employees in nearly any direction; there are fewer minds to change and fewer levels of management to get through. Additionally, startups hire innovators who are focused on new ways of doing business, which also enables them to quickly shift in unorthodox directions. 2) Embraces failure. Because startups have less at stake, they foster a culture that’s not afraid to fail. You’ll hear mantras that encourage “Fail Fast” or “Fail Forward” risk-taking in exchange for the potential of innovation. Meanwhile, established companies can be hesitant to pivot and disrupt their existing revenue streams. 3) Attracts high-risk/reward workers. Unlike stable career positions, entrepreneurial minded professionals are attracted to the startup lifestyle. This encourages wilder career moves in long shot startups, with the equity promise for high financial gain and industry fame. 4) Attracts skilled talent. Startups often attract top talent due to their sense of purpose and passion, quality of work life, perks, and promise of making it rich through equity packages rather than a salaried job at an established company. 5) They’re younger. As a whole, startup employees and founders, at least in tech, tend to be younger; they can afford to take more career risk, often with fewer family, health and financial commitments. Although controversial, Mark Zuckerberg claims they’re just “smarter” than older cohorts as they may have the latest skills, or can be easier molded. Startups are set up differently as business entities than established corporations, giving them additional advantages to take down their target markets. 6) VC funded. Ample VC funding enables radical innovation and encourages high-risk business models, often designed to disrupt incumbents through the use of networks, technology, and new methods of going to market. 7) Privately held. Startups have more freedom to disrupt an existing market, as they’re not exposed to the scrutiny over quarterly earnings like public companies are. As a result, these startups answer only to their executives and board, and they can plan beyond the next quarter. 8) Growth over revenue. Startups are not held to the same standards as publicly traded corporations. Startups are often focused on market penetration and adoption rather than just revenue. To avoid upsetting users, Facebook didn’t turn on its “mobile advertising” engines until post-IPO. The way startups deploy their day-to-day businesses is different than established companies; they move faster, with greater risk, and are able to quickly ship product. 9) Tackle niche, then grow. Startups can attack small markets, then grow them to compete with established companies. Established corporations often don’t have the appetite to defend smaller markets, giving startups the ability to gain footholds as they expand. 10) Faster than the law. Startups often challenge existing rules, laws, and regulations. They’re able to move faster than regulators, then reshape the discussion to their benefit, like Airbnb, Uber, and Lyft have. 11) Quickly ship product. Startups are known for the practice of “shipping fast” in their product releases: releasing versions daily if not hourly, and are taught that shipping a product when it’s 90% or even 80% finished is acceptable — rather than perfecting it like an established corporation would. Looking at across these 11 different ways that startups are able to outrun established corporations, you can see that the very core makeup of the culture, business setup, and their strategies are often different than older established companies. Established companies aren’t standing still, waiting to be disrupted, they are either weighing whether they should build similar features or purchase the startups outright, or emulating the same characteristics of startups. Established companies who don’t move faster, run the risk of being blind sided from a young market competitor. We’ll build on this in an upcoming report on corporate innovation and explain how established companies are starting to act more like startups and make their corporations more agile. Rather than arbitrarily throw around the “innovation” word, understand how it impacts your customers, and be specific. Innovation comes in four flavors: product innovation, operational innovation, customer experience innovation, and business model innovation. Corporate innovation isn’t easy. Stefan Petzov, an innovation professional at Swisscom, a Crowd Companies member, has outlined the many challenges that innovation programs inherently face. In particular, the first challenge he lists out is that companies struggle because “the expected outcome is not clearly defined.” Clarity is paramount. One way to solve this top-level challenge is to ensure your company and innovation partners have a standard nomenclature for how innovation is used. We looked at structuring this language around products, business units, or functions, but found it would be most helpful to structure it around customer benefit. First, some qualifications on the scope of this discussion: The following is focused on how innovation is done within a company, not about external activities like partnerships, investment, acquisition, accelerators, and more. In a recent post, we identified the ten types of innovation programs, which goes into a bit more detail. 1) Product Innovation Often led by R&D, product features are enhanced, or new products are developed based on the product roadmap. Nike evolved beyond shoes to Nike Plus, expanding its offerings. Also, new product lines like Nestle’s launch of Nespresso grew a loyal customer base. Continued improvements on product features and benefits, as well as new product lines. 2) Operational Innovation Often led by operations, new processes increase productivity and efficiency, or reduce costs associated with employees, partners, and the supply chain. In the ‘70s, Japanese automakers like Toyota and Honda increased the efficiency of auto production and reduced overall costs through kaizen. Products emerge faster, with more consistency, and often at a lower cost. 3) Customer Experience Innovation Often led by marketing and customer care, new services, interfaces, and channels are developed to improve customer interactions, while the product often stays the same. Hugo Boss partnered with Uber for product delivery, transportation, and concierge. Swisscom launched “Friends” so customers can self-support. New services beyond the core product offering, including supportive media, communications in new channels and mediums, and white-glove service. 4) Business Model Innovation Often led by innovators or strategists, companies identify complete new revenue streams from existing core capabilities. BMW launched ReachNow, enabling customers to rent vehicles on demand — rather than buy — packaged with parking services, insurance, and more. Core product and service offerings are provided in new ways that meet shifting customer expectations –reframing customer relationships in the face of disruptive technologies. With new technologies emerging at a rapid pace (who knew Pokemon Go would be a top app within just a few days), companies have no choice but to accelerate their rate of innovation. Unfortunately, most companies focus exclusively on only one or two forms of corporate innovation, forgetting others that could be a key competitive advantage to satisfying the ever-changing expectations of customers. Most companies focus on Product Innovation, which can quickly escalate into a race amongst competitors towards a commoditization that churns out less-than-useful new products rather than true innovation that revolutionizes the way customers live. In recent periods, I’ve also observed companies redeploy attention on Customer Experience Innovation as they scramble to reach customers in a multitude of digital and in-person channels. 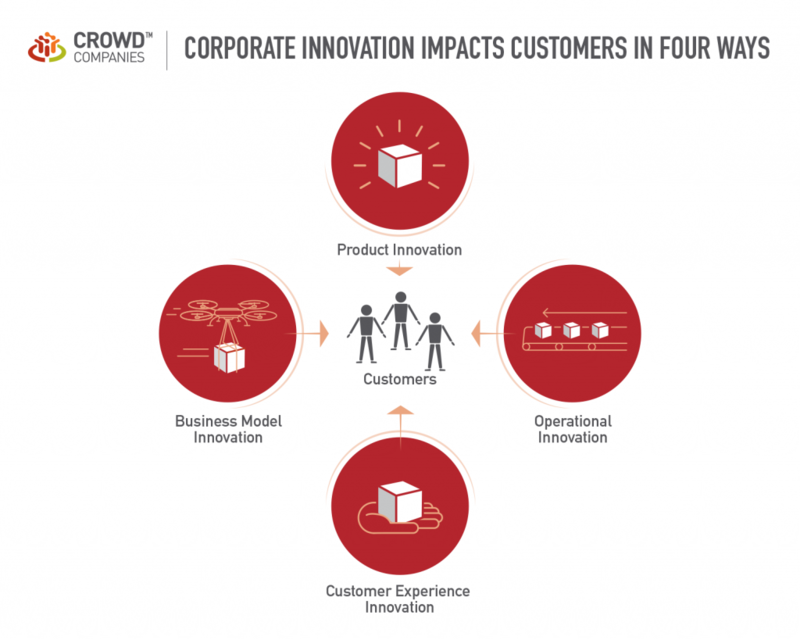 An area we focus heavily on at Crowd Companies is how companies tap into the power of people and technology to unlock new revenues by serving customers in new ways through Business Model Innovation, whether that’s in the Collaborative Economy or the Autonomous World, where robots take the wheel, and whatever comes next. To maximize customer satisfaction — and ultimately competitive edge — companies must innovate in all four of these areas, as well as ensure that the innovation management team is coordinating all efforts toward a single goal. In closing, when you’re using the word innovation, be clear about which of the four types you’re referring to, as it impacts your company, employees, and customers in significant ways. There are three topics that should be discussed as we forge the next economy: the Autonomous World, Silicon Valley feudalism, and ensuring human safety from advanced robots. For the second year, I’ll be at Tim O’Reilly’s Next:Economy Conference in San Francisco on Oct. 10–11, which brings technology, the economy, and forward-thinking industry leaders together under one roof. These events set the tone for the impacts of technology on businesses, governments, societies, and global economies. The Autonomous World. What role do humans play when robots do jobs better? This topic, which was discussed at the last Next:Economy, was a major theme –yet we’re nowhere near from settling it. Did you know the White House predicts that 83% of workers who make less than $20 an hour are likely to be replaced by robots? And it’s about a one-third replacement rate for those who make $21 to $40 an hour. We need continued dialog about solutions, including a combination of: upskilling, which will likely never catch up to robots because they will learn faster than humans ever can; and universal basic income or a guaranteed wage for all humans to offset the robots that will increase productivity and replace human jobs. Is Silicon Valley creating global feudalism models? Economically, is this the best way forward? This topic, which I’ve tackled a few times in my own keynotes, is in response to the fact that Silicon Valley startups are owned by the 1% elite — who then create platforms for the rest of society to use. Who are these 1%? Are they benevolent dictators? Early risk-takers? Deserving capitalists? Folks who just got lucky? They’re likely a combination of all of the above, but the reality is that they’re becoming the most powerful group on the planet. For example, Mark Zuckerberg could, on a whim, place his thumb on the Facebook newsfeed and fill it with content and stories that veer to either the Left or Right points of view. Elon Musk has already developed powerful space programs that are starting to challenge public sector aerospace and are innovating quickly for future world exploration and transportation. These powerful entrepreneurs not only own and control the data and technology we use daily, but they are also able to fund the nonprofits of their choosing through incredible wealth that sometimes outmatches public sector spending. To protect the human economy, should we have an “off” switch for computer intelligence? How do we influence, manage, or even control advanced robotics and artificial intelligence systems that will eventually become superior to human intellect? Should there be a standards board, a set of legislation, or even a security force that manages robots? Beyond the fears of most dystopian science fiction films, what can we do now to set the groundwork before these technologies are self-sufficient without human support. For example, scientists seek to create a system of checks and balances for advanced robots that ensure humans have fail safes, power-offs, and other security measures that could provide forms of safety. Today, technology is dependent on humans to be created, managed, and supported. Tomorrow, a new level of co-dependency will evolve. On the day after, advanced technology may be independent of human support — will we be ready for this future? So there you have it: three distinct topics that are set to reshape the economy of the future. You can see the themes of technology overtaking human jobs, those who own these technologies, and ensuring we have balance points for safety. All these and other pressing issues will demand our top insights and ingenuity in order to prepare us all for the next phases of technology, business, government, society, and the economy. Should large, established companies innovate internally or just acquire successful startups? This post is part of our continued series on Corporate Innovation, in preparation for a research report, on this topic. Last week, we published The Ten Types of Corporate Innovation Programs which looks at broad swath of options, and in this post, we’ll dive into two major choices that companies are often weighing out: building their own, or acquiring startups. Build: Corporations invest in building innovation internally, but with risks to their success. The upside of companies building their own startups from within is that they can tailor them to their specific business strategy. I’ve spent time with Nestle, which successfully built out its home coffee line, Nespresso, to fit nicely into the company’s brand, operations, supply chain, and — most importantly — culture. The downside is that there’s incredible risk for large companies to build these, and executive support is required at all phases of the venture. Among the chief risks of internally led product programs is that they require immense resources and still can have a high rate of failure, as told to me by a CPG executive who thinks a success rate of internal led innovation programs will be about 10%. This compounds the risks to corporations when competing with agile startups that aren’t as mindful about regulations and don’t suffer from a culture resistant to change. Buy: Corporations acquire startups at a hefty price tag and with potential for integration woes. Corporations often rely on acquiring successful startups. A case in point made the news two weeks ago when Unilever purchased proven subscription company Dollar Shave Club for a reported $1 billion price tag. While Unilever stands to gain in many ways by upselling its goods to existing loyal Dollar Shave Club customers, there are drawbacks: The cultures may never neatly fit together, and operations and supply chains are radically different. Fortunately for Unilever, it has a track record of successful acquisitions; for example, Ben & Jerry’s was bought in 2000 and still lives on as a power brand 16 years later, despite experts indicate that mergers and acquisitions fail up to 90% of the time. That’s a very expensive investment with a low rate of success. Often, corporations are considered the elephant graveyard of startups — the acquired founders often leave the company, after their contract is up –taking with them an entrepreneurial vibe. In between: Corporations partner with startups. Of course, there’s also a middle ground where corporations partner with many different startups and place small bets on each in terms of direct investment, or they establish limited partnerships in venture funds. They also conduct direct partnerships through relationships with startups for the purpose of cross-selling or other forms of engagement. Often, this courtship is used to glean market intelligence, get in position to double down for future investment, block competitors from getting too close, or take the startup off the market for acquisition at a later date. The downside of these partnership models is that the corporation is never fully in the driver’s seat. It’s always vulnerable to the whims of the startup’s leaders, who can often change direction as they see fit. Do nothing. Ignorance is bliss, and it’s cheap — at least for now. Risk being passed up by competitors or disrupted by startups. Build in house innovation. Tailor it to the company and culture. Requires executive support, risks failure. Acquire successful startup. A proven model that can expand market capability. Extremely expensive and difficult to integrate into the culture. Acquire failed startup. Cheap assets: IP, customers, or resources. Failed model, with resuscitation very challenging. Partner with startups: invest or collaborate. Lower-risk model with access to market intel and strategic positioning. Far less control than build or buy. Companies are deploying these three strategies, and more. We’ve yet to see any single right way to do to it. But would love to hear your thoughts: What’s the best strategy for corporations? Should they act like startups and build technology? Or purchase it by acquiring startups?